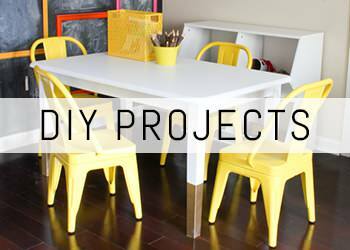 There are two types of projects I really love: quick ones and easy ones. Upholstering furniture is usually neither of those. 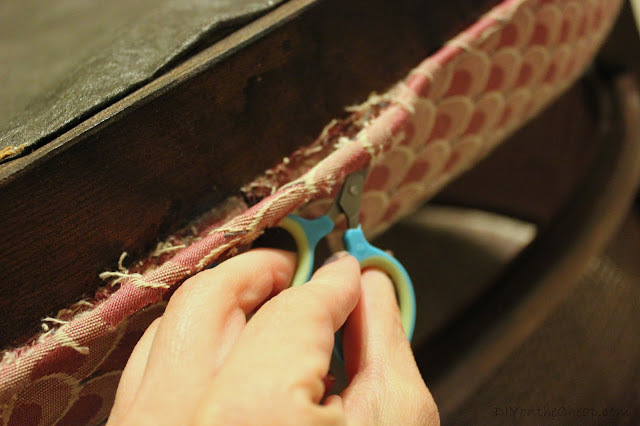 Unless you are doing a simple chair seat re-cover (unscrew seat, staple fabric onto seat, screw seat back onto chair), then upholstery projects are going to take time and effort. I pride myself on finding the cheapest, easiest solutions whenever I can. Ok, I don’t really pride myself on it. Truth is I’m just lazy and cheap. (Ha! I’m kinda kidding.) So if I can find an easy work-around to something and have it end up looking ok, then I’m all for it. I’m not going to lie to you, this project is not easy – or at least it wasn’t for me. But it was well worth the time and effort. Much of the difficulty came from this being my first try – I feel like if I took on another upholstery project it wouldn’t be as hard. Hopefully this tutorial will help make this process a little easier for you than it was for me! 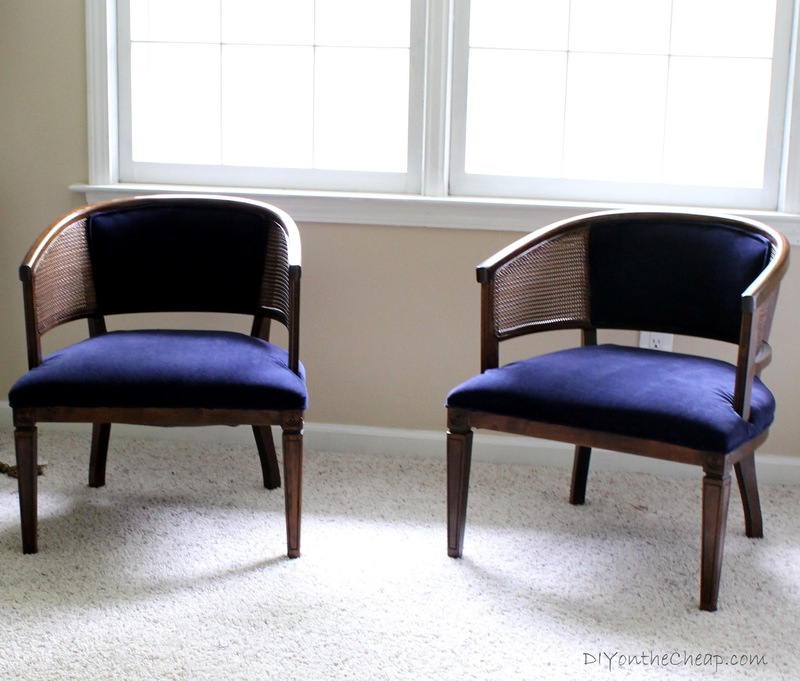 I’m going to show you how I upholstered these cane barrel chairs (which I posted about here), using the easiest method I could figure out. 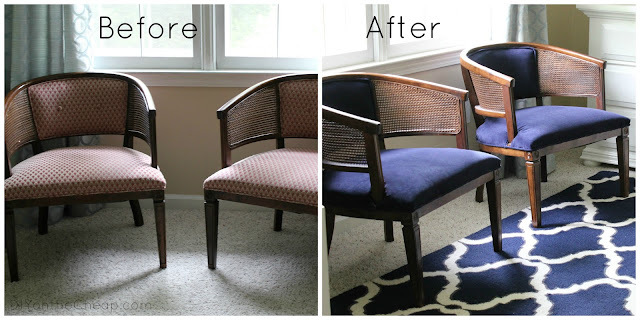 My goal was to recover them without removing the old fabric or disassembling the chairs in any way. I halfway succeeded at that. I’m not an upholstery expert (in case you hadn’t figured that out by now), and I didn’t want to totally ruin the chairs. I also didn’t want to do anything that couldn’t be “undone” just as easily, in case I ever want to change out the fabric again. These chairs were a bargain Craigslist find (thank you Craig and your awesome list!). They were exactly what I was looking for, and they are perfect for our master bedroom sitting area. I love the size, shape, finish and… oh wait.. nope, not the mauve fabric. That can go. I opted for navy velvet, and actually found the perfect fabric in the form of a window curtain from Target. Anyway, onto the process. Since I was using trial and error (and to some extent, you will too), I spread this project out over a few days since it took a few hours each day to get things “just right.” For instance, I would remove staples one day, sew cording one day, attach fabric one day. It wasn’t super quick. I have a feeling that the more times I do this, the quicker it will get. , I carefully removed the cording, keeping it all in one long strand so that I could reuse it. 2. If tufted, remove buttons. 3. Remove fabric on the top part of chair. Now, here’s where it got tricky. I had no choice but to remove the top/back part of the chair completely. There just wasn’t a way to make it look right from the back and front unless I completely redid it. The good news is, this part wasn’t as hard as I thought it would be. After removing the cording, carefully pry each staple out and remove the front fabric first, then the foam and batting, then the back fabric. 4. Use the old fabric as a pattern to cut your new fabric. 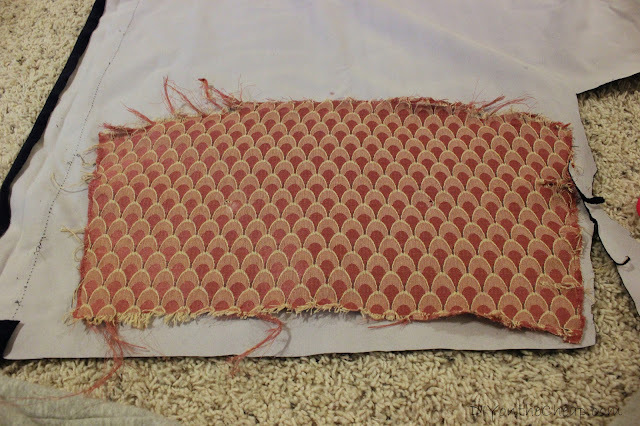 Try to keep the old fabric in tact, and use it as a template. 5. Replace fabric and foam on top half of chair. Face the front of the chair, and insert your “backing” fabric facing away from you inside the top back part of the chair, and staple it in place. Place the foam and batting in front of it, then the front fabric layer and carefully staple that in place too. Be careful with your staple placement! Try to line them up as best you can and position them inside the little divit that runs along the wood. You will be covering the staples with cording, so you’ll want them in a straight line. 6. Now for the seat. Ugh. The seat. Ok, most people will remove the seat the same way I removed the top/back of the chair and use the existing fabric as a template for the new fabric. That’s a great idea and if it’s easy for you, then you should do it. However, my chair seat was not going to budge easily, and I started removing the fabric but it was taking a hundred years to pry each staple out. I finally decided it would be a whole lot easier to just leave it as is and cover it. The first chair was a nightmare. It was trial and error, with an emphasis on error. The hardest part is getting the fabric to fit smoothly and carefully cutting it to fit around the parts where the back/sides meet the seat. (I didn’t have the existing fabric to use as a template, remember.) It was bunching awkwardly and I kept cutting it to the point of butchering it. I finally found that it was best to a) not insert a single staple whatsoever until I have the seat fabric looking perfect and smooth and positioned exactly how I want it, and b) start from the back. I started pulling and cutting a little bit at a time until I could tuck the fabric around each support (? stick? arm? wooden thing?) where the back/sides meet the seat, then I would move onto each side, and finally the front. Pulling, tucking, cutting. Slowly and carefully. Don’t be too scissor-happy! and staple it in place. If you have a pneumatic upholstery stapler, you are awesome. I for one simply used a regular old staple gun and an electric staple gun in some areas. As mentioned above, position your staples inside the little divit in the wood (if there is one on your piece of furniture), and in a straight line. You can use a small screwdriver or something similar to tuck any excess fabric inside the divit so it doesn’t fall below your staple line/cording. After stapling, trim away your excess fabric, cutting it as close to the staples as possible. didn’t decide it hated my guts. You see, my fabric was super thick because of the blackout lining, and my machine rejected it and then promptly broke and I had to take it in to be repaired. (Sidenote, anyone in the north Atlanta area must check out Atlanta Sewing Center for all things sewing-related. They were amazing and fixed my machine for free since it was such an easy fix!) Since I was not patient enough to wait for my machine to be fixed, I hand sewed my cording. All 4 super long strands of it. Basically what you do is cut a 2 inch wide (and however long your cording is) strip of fabric. If your fabric isn’t long enough, you can just add more length with a second or third strip. 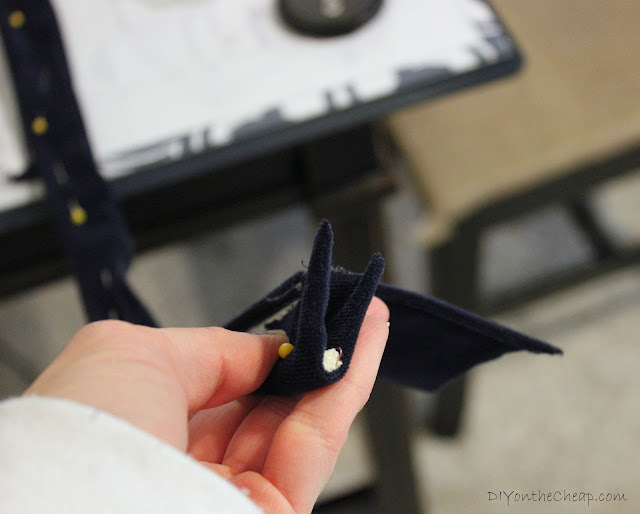 Use a cording foot or zipper foot to sew your seam as close to the cording as possible. (This is where I hand sewed instead.) Cut away excess fabric as close as possible to the seam. 8. 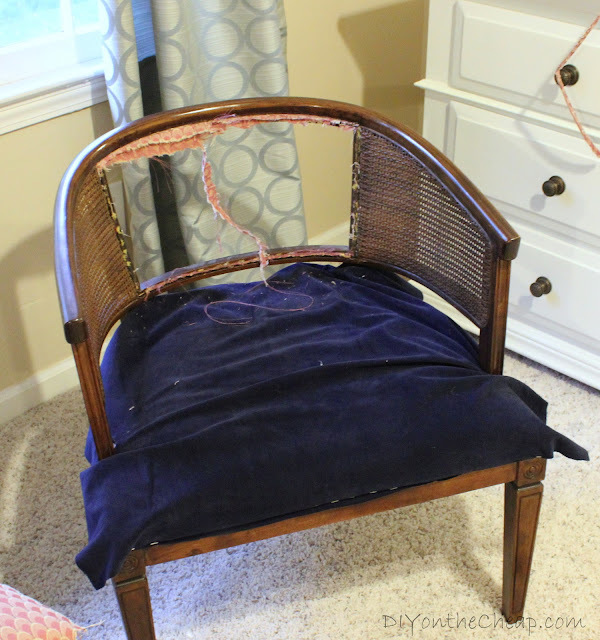 Attach your cording to the chair. 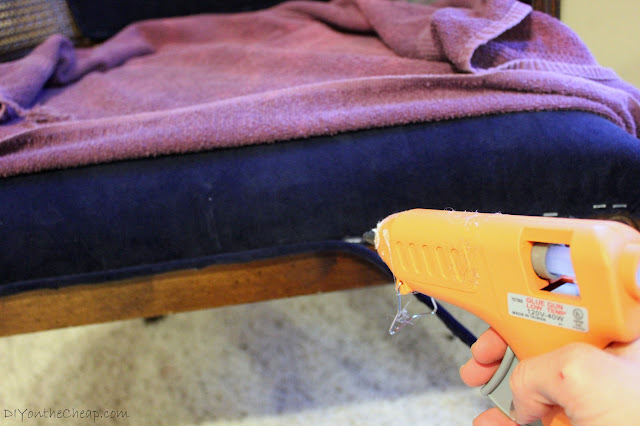 , carefully covering the chair with old towels so I didn’t get any gnarly glue strings all over my newly upholstered seat. Just leave a small section exposed where you want to attach the cording. Go slow and work in small sections. Glue 3-4 inches at a time and attach the cording. Be sure to cover all of your staples. For the chair back, I started and ended the cording at the bottom so the seam isn’t all that noticeable. With the seat, I started and ended at the back of the chair. The cording is actually attached very tightly and it would be hard to remove it, so I’m perfectly fine with the fact that it’s glued on. 9. You’re done! Now go take a nap. You deserve it. Now let’s look at a couple of photos of the final product! Will you give reupholstering a try? If you have any questions, let me know and I will do my best at answering them! If you’re new here, please consider subscribing via RSS or by email. 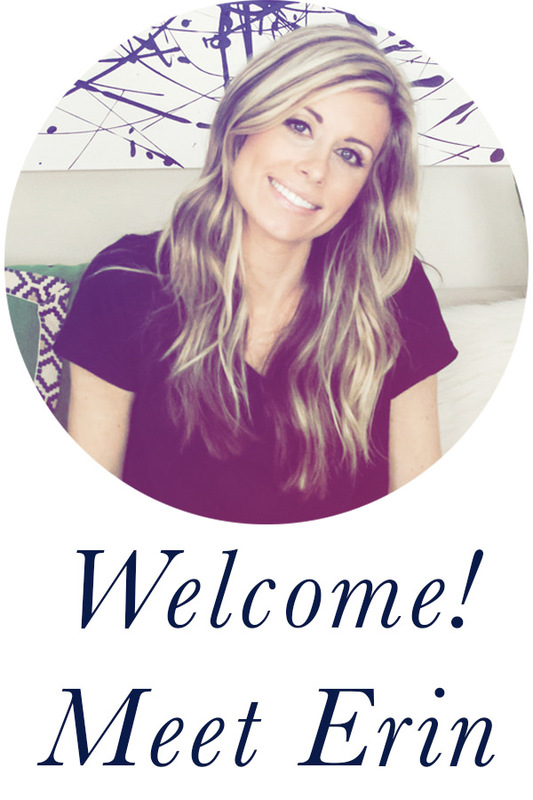 You can also connect with me on Facebook, Twitter, Pinterest, Instagram and Google+. Thanks for visiting! I am super grateful for the shortcut tips–especially the cording recycling and hot glue. They will be put to use in the next month as I attempt to reupholster four of my own chairs. Good luck! It’s worth the work in the end. Can’t wait to see your chairs! These look awesome re done! Well done job!! Wow, they came out looking really good! Unfortunately this looks way too difficult for me, LOL. We did get our couches and kitchen chairs reupholstered several months ago but had it done somewhere. Thank you Rachel! This definitely wasn’t the easiest project I’ve ever done, but for $30 total it was worth the work! I can see why people opt not to do this themselves though. It takes some patience for sure. Thanks Jenny! That is awesome – please share pics if/when you reupholster it! I’d love to see it. 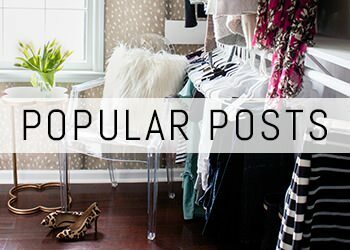 I have been looking for chairs like this and want to redo them for my husband’s office! Yours turned out great – not sure if I’m brave enough to attempt it, but at least I have your tutorial as a guide! Well done! Thanks Jenny! You can totally do it! It sounds more intimidating than it is. As long as you take your time, you’ll do fine. You did a lovely job on this pair of chairs. Unfortunately, in the past I have succumbed to the temptation to just drop them off at the local upholsterer and say “See ya in a week”.. You have kind of given me hope that I might be able to manage this. Thanks so much Maude! I totally understand taking them to an upholsterer. It’s tedious work, but doable! You HAND SEWED all of that piping!?!?! WoW! I used wide, sloppy stitches since I knew they wouldn’t be seen. 🙂 I worked on it while I watched a movie with the boys so it wasn’t so bad. This turned out awesome! I am pinning for future reference! 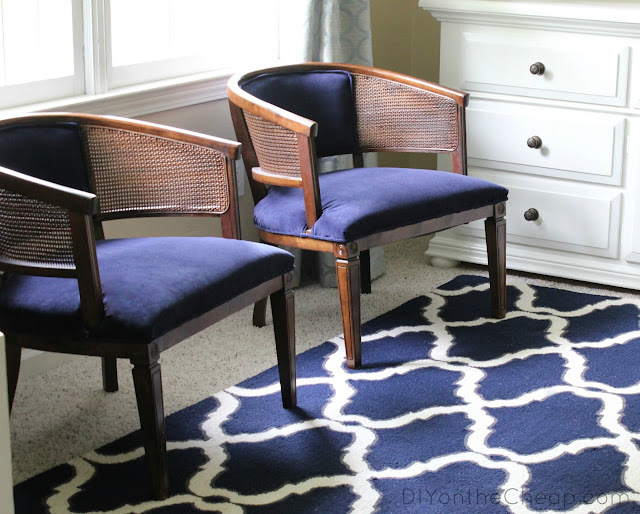 I love them in that blue color…and it looks fabulous with your rug!! Thanks Niki! I appreciate that! These look wonderful! Thanks for sharing your upholstery adventures. I have yet to tackle more than a seat cover, but with your instructions (and funny side comments!) I think I might be able to do something like this in the future. Hope you had a great weekend! amazing! now what can i reupholster!! You Rock!!! Thanks for the reupholstering tips!! I am impressed. If I didn’t see your photos and read about the journey (sewing machine calamity – it’s so typical!) I would have thought this was easy. LOL. 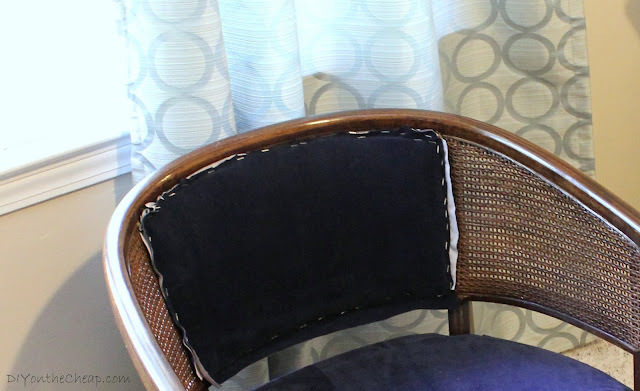 I plan to reupholster 2 chairs after I figure out how to repaint them but the cushions come out and I plan to do the wrap-new-fabric-over-the-old-fabric routine. I hope it’s as easy as that sounds. Thanks so much for sharing the learning. Thank you! This was definitely a little tricky but your method will be much easier since the cushions come out. Good luck! This is a great post! Very helpful! My mom and I are going to try to renew a chair we found on the side of the road soon (yay, free stuff! ), and this will definitely be out guide through it! However, we’ve noticed there isn’t any wood on the bottom under the seat. So, basically, if someone were to try to sit in it right now, they’d fall through. I was wondering if you had any tips on how to put wood in it, and if we should cover the whole bottom with wood, or only a few slats across? Thanks in advance for the help! Hi Alaina! That’s so strange that there isn’t any wood. Normally there is a frame and springs and all that, depending on the type of chair. You could use a jig saw to cut plywood to the correct shape and then cover with batting and fabric and screw it on to the chair. Or, you could try just doing slats and connecting them with wood braces and covering with batting and fabric. What type of chair is it? I’d have to see it to give a good recommendation. Good luck with the makeover! I’d love to see before and after pics! Just found your blog and this tutorial. I recently completed reupholstering an old rocker and encountered many of the same trial and errors you did! Removing the 3 zillions staples was the worst! I see all my errors in the finished product but my friends are amazed I even attempted it. $45 for a new to me chair isn’t bad though. Ohh Gina those staples were a nightmare! I agree, the price makes the work worth it. Glad you can share in my misery though! Ha! This is brilliant! I’ve always wanted to complete a reupholster project but I would always convince myself that it was much too difficult. Your post has inspired me to get over my fears and just do it already! Thanks! Thank you Jenn! You can totally do it! 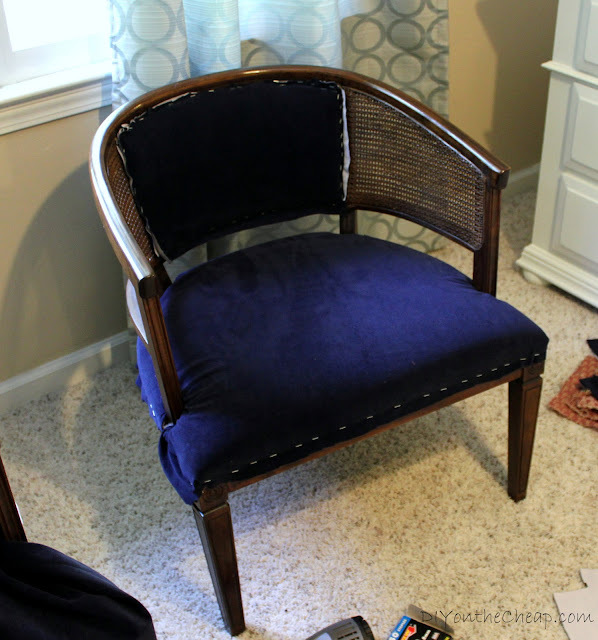 LOVE the navy velvet fabric! Wow, what a transformation! Really love the colour too 🙂 Thanks for the post and the images. Tempted to try something similar to this myself now! I have a similar chair I’m reupholstering & I was wondering what you did for around the arms? Did you fold the cloth underneath itself to give it a nice edge & then did you use the piping around it? It is hard to tell in the pictures, but the seat I’m working on also has a similar issue where you cannot take off the seat portion to staple all the fabric underneath & I’m wondering how I’m going to do it! Hi Justine! Yes, that’s exactly what I did. I’m definitely am going to try something like this! Thanks for your nice comment! Have a great day.